Pros: Price is reasonable considering this model features the more powerful K4 motor. Full Control trigger and lance are a handy addition if you often clean different surfaces. Plug and Clean system is great if you plan on using a lot of detergent. Good 3-year guarantee. Cons: Does without the patio cleaner found in the Home versions. Summary: A good value-for-money pressure washer that offers good performance, lots of handy features and storage/transport solutions. We would definitely choose this over the cheaper K4 Compact. 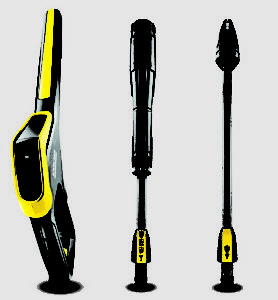 Where does the K4 Full Control sit in the Karcher range? This model is one of the best selling Karcher pressure washers, even though it’s not one of the cheapest. 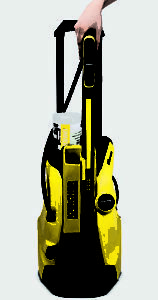 In terms of the Karcher pressure washer range hierarchy, the K4 Full Control pressure washer sits above the base K4 Compact and below the “Home” version of the K4 Full Control. There isn’t usually much difference in price between the base Compact and this model whereas the Full Control Home version is usually above the £200 mark. To learn more about the full range, take a look at our Karcher pressure washer buying guide. With this being a K4, it features a 1.8 kW water-cooled motor (versus a 1.4 kW air-cooled motor found on the K2’s). Maximum pressure is 130 bar which is 18% higher than the K2. Water flow rate is 420 litres per hour (17% increase versus the K2). With this level of performance, an area of 30 square meters can be covered in an hour (which is up an impressive 50% versus the K2’s 20 square meters per hour). As with all Karcher pressure washers except the K7, this model has a maximum hot water inlet temperature of 40 degC. All models feature a water inlet filter to help protect the motor from dirt ingress. This model features the “Full Control” G145Q spray gun and Vario Power spray lance. The lance is simply twisted to change the setting between soft, medium and hard pressure settings plus a mix setting is available for when the pressure washer is used with detergents. The LED display on the trigger gun allows you to then check the pressure setting allowing you control every aspect of the clean and ensures that your pressure washer is on the correct setting. The Plug and Clean system on this K4 is a great feature. It’s included on all K4 models expect the Compact. This is a really useful addition that does make life easier if you plan on using a lot of detergent when pressure washing. Simply connect the Plug and Clean detergent bottle into the top of the pressure washer and you’re ready to go. 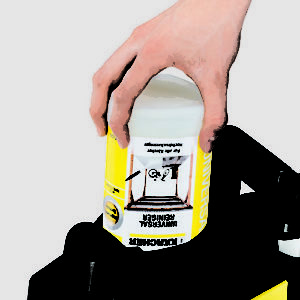 This also makes changing bottles between different applications (for example patio cleaning and car washing) very easy. The other plus point is that the Plug and Clean detergents are not overly expensive to buy. Overall, this is a much better option than the suction pipe method on cheaper models. All K4 models have a 6-meter hose, which is a good length (and an improvement on the K2’s, 4-meter hose). The longer hose means you can leave the pressure washer in one place without moving it around too much (although shorter hoses are easier to store). Some users have previously mentioned the quality of the hose on the K4 model, suggesting it is rigid and curls over easily. This model weighs in at 11.4kg (without accessories), which is not excessive but much heavier than the lightweight K2 which weighs under 5kg. The weight shouldn’t be much of an issue though as all K4s have wheels and a telescopic carrying handle. There is also a lower handle that makes carrying easier (for instance, if you needed to load into a car boot). The parking position is also a key feature of this model. The nozzles can be stored easily on the washer which is handy when storing and in use. The K4 comes with a 3-year manufacturer’s guarantee which should give extra piece of mind. 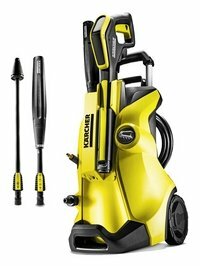 Read more Karcher K4 Full Control pressure washer reviews here. For further information on pressure washers, including best sellers and what to look for when buying, take a look at our full Buying Guide.